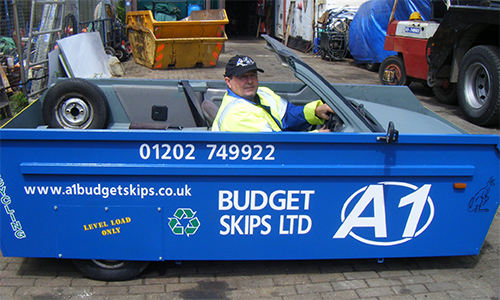 A1 Budget Skip Hire Ltd can service all your domestic & commercial waste removal needs. Whether you require a single skip for a small project, one of our larger skips to cope with extra waste or building rubble etc., or a specialist plasterboard / asbestos skip, our growing fleet of skips and skip lorries can cater for your needs. We offer a fast and courteous service to both domestic and commercial customers. If you are new to skip hire, selecting the right size can be confusing. If you are not sure of the size you require, it may be more cost effective to choose a larger skip, than to hire a second one later on. Make sure your property has access for the delivery vehicle, and it can be sited on or off your property. We have skip sizes of 2, 3, 4, 6, 8, 10 and 12 yards, follow the link to see the exact sizes. We hire skips throughout Bournemouth,Poole and Christchurch, including Wimbourne Skips and further afield in Dorset.